He was born in Buenos Aires-Argentina as the elder of a two son family whose father was a Doctor of Dental Surgery. In 1965 Dr. Carlos Alvarez Bermudez graduated as MD at the School of Medicine-University of Buenos Aires, that is the same university where studied A. Houssay, L. Leloir and C. Milstein, the three outstanding argentine researchers who won Nobel Prizes in Sciences. In 1970 he married Josefina M. T. Puelles,a beautiful and talented young women who already then spoke five languages. He moreover fulfilled studies at the highly prestigious Jesuit University USAL, where his Doctoral Thesis about Scientific Research Methodology got Diploma with Honors. He obtained important Fellowships (WHO, PAHO, etc) to complete postgraduate studies at outstanding Research Centers in: Washington DC-USA (National Institutes of Health, Georgetown University); London-UK (Imperial Cancer Research Found); Milano-Italy (National Cancer Institute); etc. In early times as MD he spent an entire year in the South Pole, where he was the only one Doctor and Medical Researcher in the argentine Scientific Polar Station “Sobral”, located at most southern latitude and relatively near the U. S. Amundsen-Scott Polar Station (S.P.). He carried out there important Physiology and Medical studies related with persons exposed to extreme life and weather conditions, such as complete isolation during more than six months of the whole Polar Night, living permanently in small under-snow facilities -like in a U Boat- and with outside temperatures of -67, 5 C, one of the lowest in the history of Planet Earth. For this action he was later designated as “Knight of the White Desert Order”. 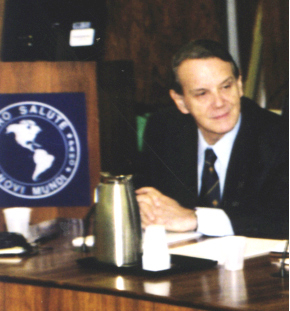 In the Medical Care / Teaching Areas and specially in the field of Scientific Research Methodology in Health Sciences, since he was a student and later as a young Doctor, Chief Department and Professor, he fulfilled continuous and multiple interventions orientated at different levels in outstanding Universities and Organizations such us Georgetown University (VP), PAHO, UBA, USAL, Hosp. Cir. My. C. Argerich, IUCS, AMA, UCA, ILSI, CREAD, etc. In the Research Area he was author of many scientific papers and books. Moreover and having in mind the strong argentine scientific tradition, three Nobel Prizes in Sciences, he was aware about the importance of early and proper international research teaching and training. In consequence he always supported this kind of praxis for Juniors Researchers and for this reason he created and is leading the International Scientific Research Courses since 1990, from where several thousands Juniors and Seniors Researches have graduated; among them we must mention two outstanding young medical researchers: Dr. Sebastian Gimenez, who lives in the USA and is the International Coordinator of these activities, and Dr. Diego Delgado who lives in Canada. La Asociación Médica Argentina (AMA) se dedica desde 1891 a la Educación en las Ciencias de la Salud. El Curso Internacional de Investigación se ha sumado a este desafío por invitación de su Presidente, Prof. Dr. Elías Hurtado Hoyo.